Leicester booked a home European Champions Cup quarter-final as they ran in seven tries in a comprehensive win over Benetton Treviso. 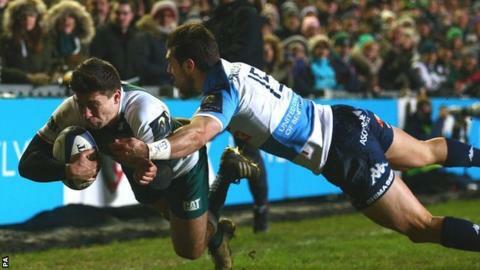 Michael Fitzgerald began the rout before Vereniki Goneva, Freddie Burns, Adam Thompstone and Ben Youngs scored. Replacement Laurence Pearce crossed for the final try deep in the second half. Centre Manu Tuilagi, making his first start in 15 months after a groin injury, lasted 51 minutes before making way for replacement Peter Betham. Treviso, bottom of the Pro12, have lost 16 successive matches in all competitions and were behind inside two minutes as Tuilagi skipped through a tackle before sending Fitzgerald into the corner. The Italian side barely set foot in the Tigers half, but made a rare raid tell when Andrea Pratichetti took a great pass from lock Filo Paulo and scampered clear for their only try. The scoring slowed in the second half as the snow fell and handing became more difficult, but Burns showed lovely skill to gather his own finely weighted grubber kick and dot down. Leicester complete their pool campaign at Stade Francais next Sunday, hoping to improve their ranking and ease their route to the 14 May final in Lyon. Leicester: Bell, Thompstone, Tait, Tuilagi, Goneva, Burns, B. Youngs, Mulipola, T. Youngs, Cole, Barrow, Kitchener, Fitzgerald, Croft, Crane. Replacements: Betham for Tuilagi (51), Bai for Burns (65), Kitto for B. Youngs (47), Ayerza for Mulipola (47), H. Thacker for T. Youngs (55), Balmain for Cole (45), De Chaves for Kitchener (41), Pearce for Fitzgerald (63). Benetton Treviso: Hayward, Pratichetti, Christie, Sgarbi, Ragusi, Ambrosini, Lucchese, de Marchi, Gega, Manu, Paulo, Montauriol, Lazzaroni, Minto, Barbieri. Replacements: Bacchin for Christie (53), Traore for de Marchi (48), Giazzon for Gega (48), Ferrari for Manu (48), Steyn for Barbieri (53). Not Used: Fuser, Zanni, McLean.